Councillors will be aware that as part of the Division of Local Government’s Better Practice Review, it was recommended that Council conduct internal auditing (separate to the annual external audit conducted by Forsyths). Council has already resolved to form an Internal Audit Committee and adopted a proposed schedule of areas to be reviewed. A review of development application processing was scheduled for 2013, but it is proposed to bring the review forward. 1 That at the Internal Audit meeting of 5 July 2011, Council request that the scheduled 2013 review of our development application processing be brought forward. Councillors will be aware that as part of the DLG’s Better Practice Review, we are now required to conduct internal audits (separate to the annual external audit conducted by Forsyths). Council has already resolved to form an Internal Audit Committee and adopted a proposed schedule of areas to be reviewed. A review of development application processing was scheduled for 2013, but it is proposed to bring the review forward. Development application processing is an integral part of the service Council offers the community. Whether pro-development or pro-conservation our community expects Council to provide this service accurately, and efficiently. Recently two development applications have come before Council with disputed conditions (East West Rd and Mill Lane). In order to avoid formulating conditions ‘on the run’ Council has had to defer the matters. We have also seen a recent application where a local parish essentially wasted $750,000 on a site specific application which was refused because of an obvious constraint that was identified before the application was lodged. This same application highlighted a policy shortcoming when the Joint Regional Planning Panel criticised our Flood Policy for not considering an educational establishment. Any shortcoming in our development application processing procedures and policies has the potential to cost applicants money, objectors money, and Council money, especially if an application is challenged in the Land and Environment Court. Council should be concerned about mitigating risk to our own organisation, applicants and the community. Quality communication and consultation is a means of achieving this. The engagement of an independent professional planner would come at a ball park cost of $5000, but to put this cost into perspective, one single ‘missed’ condition on the Oyster Creek development which was recently identified will cost at least as much. The intent of the review is to scrutinise our development application assessment policies and procedures. The review should be conducted independently of Council and by suitably qualified people. It is envisaged that the review would consider all factors relevant to application processing performance. I request leave for the period 13 June 2011 – 4 July 2011 inclusive, for personal reasons. To seek endorsement of Council to proceed with a variation to the Coffs Harbour Regional Resource Recovery Project Contract to modify waste processing and resource recovery operations. This is in response to recent amendments to the Protection of the Environment Operations (Waste) Regulation 2005 and Exemption provisions that have introduced more stringent requirements in regard to organic outputs derived from mixed waste. This report is being presented to Coffs Coast Waste Services partners for consideration, being Nambucca Shire Council, Bellingen Shire Council and Coffs Harbour City Council, to the meetings of 16, 22 and 23 June 2011 respectively. It is recommended that Council accept the proposed option 1 being to upgrade the biomass plant and manufacture product to meet requirements of the waste exemption. · the best socio/political outcome by maintaining the dual line approach to waste processing, maintaining faith with and by the community and continuing to pursue the vision of Coffs Coast Waste Services. Acceptance of option 1 will not increase Council’s waste charges in 2011/2012, although it will increase waste processing costs in future years. Balanced against this is that the three Councils will avoid a greater proportion of the NSW Government’s waste levy which is payable on all waste disposed to landfill. The rate for the 2011/2012 financial year is set at $31.10 per tonne, however it is rising cumulatively at the rate of CPI + $10 each year until 2015/16. Council’s options are limited to the extent that our waste management service is a joint waste collection and recycling contract derived from a tripartite agreement between Coffs Harbour City Council, Bellingen Shire Council and Nambucca Shire Council. Therefore Council is not really in a position to act unilaterally but rather must work in agreement or consensus with the other councils. A preferable governance arrangement would be for a single authority to be responsible. As it stands Council is responsible to its ratepayers for the waste service but in reality does not have effective control over significant variations to the contracts or the administration of the contract generally. Even though Council has been provided with little notice of the required contract variation, it has been advised that deferral of the contract variation beyond 30 June will result in additional costs being borne by all of the Councils. Following on from a briefing for Councillors and staff from the three Councils which was held at the England’s road waste facility last Thursday 9 June 2011, the following report has been prepared by staff of Coffs Harbour City Council for the consideration of Nambucca Shire Council. In 2005 Coffs Harbour City Council entered into the contract with Biomass Solutions (Coffs Harbour) Pty Ltd for processing organics, mixed waste and biosolids. At the same time the three Councils entered into a Tripartite Agreement that effectively binds the parties to that contract and joint waste management services for twenty years. Under the waste processing contract streamed organics that includes food waste, green waste and biosolids are shredded and processed via an agitated composting bay process, and subsequently screened and mixed as necessary to produce “A” Grade compost that meets market and regulatory requirements. Streamed Mixed waste undergoes a process involving primary manual and mechanical sorting, autoclaving, secondary mechanical and manual separation of output fractions to produce recyclables, a screened organic fraction for reuse, and residual waste that is destined for landfilling. The sterilised organic fraction generally undergoes composting in the agitated bay system, followed by screening and mixing with other products as necessary to produce a product that met the then prevailing Biosolids Guidelines. 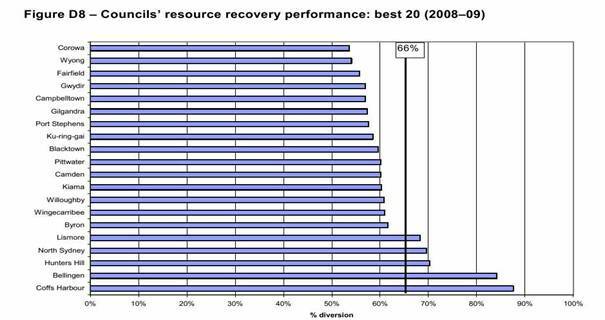 The Coffs Coast Waste Services domestic waste collection and processing operations were achieving outstanding rates of resource recovery as shown in the following OEH graph that shows performance relative to the NSW target. Note: Nambucca’s figures which are similar to Coffs and Bellingen were not included due to a technical glitch. On 24 April 2008, the NSW Government introduced amendments to the Protection of the Environment Operations (Waste) Regulation 2005 which took effect on 28 April 2008. The amendments, required, inter alia, that wastes including any products produced from wastes must not be used without the benefit of a relevant General or Specific Exemption pursuant to Part 6, Clause 51 and 51A, of the Protection of the Environment Operations (Waste) Regulation 2005. These changes created turmoil in the waste processing and resource recovery industry across NSW. Numerous AWT plants and Councils throughout NSW were affected and contracts for new AWT facilities were put on hold. In January 2010, Coffs Harbour City Council, Nambucca Shire Council and Bellingen Shire Council submitted an Issues Paper to Hon. Frank Sartor, Minister for Climate Change and the Environment. The Issues Paper highlighted the significant concerns of the councils and urged the Minister to take decisive action. In April 2010 the NSW Government released the “The organic outputs derived from mixed waste general exemption” pursuant to the Protection of the Environment Operations (Waste) Regulation 2005 – General Exemption under Part 6, Clause 51 and 51A. However the General Exemption remained unworkable for Biomass Solution’s waste processing operations due to the particular characteristics of the Coffs Coast Waste Services operations, the plant design and markets. A more workable “Specific Exemption” was sought and after protracted negotiations the then NSW Department of Environment, Climate Change & Water issued the “Protection of the Environment Operations (Waste) Regulation 2005 – Specific Exemption under Part 6, Clause 51 and 51A - The Coffs Harbour CCRRF organic outputs derived from mixed waste exemption 2011 which came into effect on 28 March 2011. It should be noted that the regulatory changes do not significantly impact upon the processing and use of organics which includes material collected in the green lidded bins, nor biosolids that are delivered to the plant from sewage treatment plants. The changes primarily concern the processing of mixed waste which includes the material collected in red lidded bins. - testing and reporting requirements. Option 3: Mothball the mixed waste processing line, implement limited recovery of recyclables, bale the waste and direct the waste to landfill. Under this option the Biomass facility would be modified to permit the manufacture of products that meet the conditions of the Specific Exemption. This option will require significant capital investment in new plant and higher mixed waste processing costs. · a full-service deliver and apply scheme for the application of product to land. Under this option, the mixed waste side of the facility is shut down and placed on a care and maintenance schedule, with mixed waste delivered direct to landfill. The proposal allows for close down of the mixed waste side of the facility with periodic operation of the autoclave and associated equipment to maintain the facility in reasonable working order. Some key staff are to be retained for the care and maintenance operations, but no substantive efforts are made at recovering products from the mixed waste stream, which is instead directed straight to landfill disposal. In the event that regulatory provisions and or market and technology conditions become more favourable, if ever, the plant could be reactivated at a later date. Under this option, the mixed waste side of the facility is shut down and placed on a care and maintenance schedule as above, the mixed waste is baled and then delivered to landfill. The option requires capital injection for baling operations but will achieve higher compaction densities of product that is destined for landfill with consequent savings in landfill space and transport. Chartered accountants Davies Knox Maynards were engaged to independently review Biomass’s financial models for the three options put forward and to determine whether these have been correctly costed. “The audit work undertaken confirmed the conclusions from the original Biomass Solutions costing that option 1 was clearly the lowest cost option over the years forecast from 2011 to 2027. Consultant, Wright Corporate Strategy was engaged to prepare an overall assessment of the Biomass options going forward. The consultant was instructed to take into account the NSW Government’s new “Reducing Waste: Implementation Strategy 2011-2015”, technology and regulatory risks as well as the financial, environmental and social sustainability of options over the remaining term of the waste processing contract. The consultant was also asked to benchmark Biomass’s waste processing costs and practices against other similar operations that exist or are proposed. The consultant’s recommendations as dot pointed above have been addressed in the terms of the proposal now presented to Council for consideration. · with the addition of the capital and operating cost increases associated with the Option 1 response from Biomass Solutions, the proposed fully inclusive gate fee is in the order of two thirds that currently apparent in the Sydney metropolitan market. If required a copy of each of the above consultant’s confidential reports is available from the General Manager for review by Councillors. “Achieving a reduction in waste generation, and turning waste into recoverable resources is a priority for NSW” - NSW Waste Avoidance and Resource Recovery Strategy. “Regulatory mechanisms such as the waste and environment levy help drive waste avoidance and resource recovery by providing an economic incentive to reduce waste disposal and stimulate alternative waste technologies.” - NSW Waste Avoidance and Resource Recovery Strategy. The Coffs Coast Waste Services operations and proposed upgrade of mixed waste processing operations accords with the NSW Government’s “Reducing Waste: Implementation Strategy 2011-2015”. Coffs Harbour City Council entered into the contract with Biomass Solutions (Coffs Harbour) Pty Ltd for the Coffs Harbour Regional Resource Recovery Project. Bellingen Shire Council and Nambucca Shire Council are party to the scheme by way of a binding Tripartite Agreement. “The WPC contends it can produce organic outputs derived from the MRW delivered to the CCRRF that will comply with the 2011 Exemption provided the Plant there is modified and upgraded. The modification and upgrade will result in the imposition of increased Availability Charges and Processing Charges. Adoption of Option 1 as a way forward will require a variation of the contract, the principle elements of which are outlined in the confidential attachment. · It should be emphasized that workable General Exemptions are in place with regard to the Biomass’s Organics and Biosolids streams. The current upgrade proposal only pertains to Biomass’s mixed waste processing stream. · If and when the Councils resolve to proceed with Option 1 to upgrade the plant to meet new legal requirements, Biomass advise that it would take 12 months to procure equipment and commission the new plant to fully process the mixed waste stream. In the interim mixed waste would be processed to recover recyclables such as glass, aluminium, steel and hard plastics, but the organic rich fraction, reject and residual materials would go to landfill. The plant will continue to process the Organics and Biosolids streams to produce high quality compost for beneficial use. · Further work is being undertaken by Council staff to refine the arrangements between the Councils with respect to the disposal of reject and residual waste and the apportionment of availability fees on a more equitable basis. · Work has commenced to explore ways in which the Councils may better integrate waste management operations, to reduce administration and operational costs and provide for long term certainty regarding regional waste disposal options. This will be the subject of future reports to Council. · There are concerns that OEH may again change the goal posts at a future time. OEH and the industry are funding scientific studies that are being conducted over the next four years in respect to the land application of mixed waste organics. These studies may lead to strengthening or relaxation of requirements, although the signals from the Department indicate that the highly stringent requirements that have been introduced are unlikely to significantly strengthened in the foreseeable future. · As a result of industry and local government input the OEH has reversed its position of resisting the use of AWT organics for power generation and is now preparing a Policy in favour of waste to energy. This may eventually open up opportunities to market Biomass’s refined mixed waste organics to supplement feedstock requirements at large and small scale power stations, such as the Broadwater Sugar Mill and Harwood Sugar Mill, or coal-fired power stations. · Should the Councils defer resolution of this matter beyond 30 June 2011, Biomass Solutions have indicated that Option 1 would need to be recosted. Fresh quotes would be required from suppliers, and adjustments would need to be made to prices to take into account consumer price index and construction index increases. In addition delays would push forward the commissioning date with consequent implications of additional mixed waste organics being directed to landfill and transport and NSW Waste Levy payments. There are very significant costs that may arise from unnecessary delays in making a decision on this matter. Once the Councils resolve to proceed with the recommended Option 1, Biomass have indicated that it will take up to 12 months to procure equipment, modify the plant and put in place the necessary operational and product marketing measures. Conditional upon resolution on this matter prior to June 30 2011, it is envisaged that the revised mixed waste processing system will be commissioned no later than 1 July 2012. Coffs Harbour City Council has undertaken extensive consultation, discussions and high level meetings concerning the regulatory changes and related issues with the now Office of Environment & Heritage (OEH), the Waste Management Association of NSW and AWT industry players. A workshop was held concerning this matter for the Mayors, Councillors and senior staff of the three Councils on Thursday 9th June 2011. CCWS operations are designed to optimize recycling and resource recovery, beneficial reuse, and to minimise waste to landfill. The change in legal requirements and standards for processing and use of CCWS mixed waste has meant that the organic fraction has had to be landfilled in the interim until the plant can be upgraded to satisfy the new requirements. Should Council proceed with Option 1, resource recovery rates will significantly increase and waste to landfill will decrease, as will landfill levy payments to the NSW government. Recovery rates for the three bin Coffs Coast domestic waste stream would be restored to around 80%, the highest in NSW. A key sustainability consideration is the carbon implications of the waste processing solution. The new waste processing under Option 1 will consume more electricity and therefore increase potential carbon emissions. However notwithstanding these impacts, the sustainability of the proposed way forward in Option 1 is considered superior to either of Options 2 or 3. The community has demonstrated strong support for recycling and resource recovery as is evident by the high levels of recycling and low levels of contamination in the domestic green bin and yellow bin service. Surveys have demonstrated high levels of satisfaction with CCWS and the recycling and resource recovery systems. The Councils have invested in education programs over many years to increase community awareness and support for waste reduction, reuse and recycling. It is therefore important that Council continue to provide services and waste recycling and recovery to meet community expectations. The recovery of waste resources including organics reduces the quantities of waste that are directed to landfill. Landfilling is an expensive activity, more so since the introduction of the NSW governments Section 88 waste levy payment requirements. Effective from July 2009 mid north coast and north coast councils are required to pay a waste levy to the NSW government for waste that is directed to landfill. The rate for the 2011/2012 financial year is set at $31.10 per tonne. Further, NSW statute provides that the Levy is to rise cumulatively at the rate of CPI + $10 each year until 2015/16. Waste processing and the marketing and utilization of waste products generates local employment. Upgrading the plant to meet the new requirements as per Option 1 will significantly increase mixed waste processing costs but is the least expensive option overall over the balance of the contract. Option 1 will minimise waste to landfill and waste levy payments to the NSW Government. Councils are obliged to provide sustainable waste services on behalf of their communities. It is also consistent with this Council’s mission to value and protect its natural environment. The increased waste processing costs to meet the relevant Exemption will need to be recovered through fees and charges. Additional charges in respect to mixed waste that is collected under the Coffs Coast Waste Services domestic waste will need to be recouped from annual Waste Management Charges. Other product such as commercial mixed waste that is suitable for processing would be subject to higher gate charges. For the purposes of estimating the impact on annual Waste Management Charges, it is important to note that the change in pricing does not apply to the organics collected in the green lidded bin, nor recyclables collected in the yellow lidded bin. The price increase relates only to mixed waste collected in the red lidded bin. Average quantities of mixed waste collected for each waste management service amounts to around 342 Kgs per annum. During the 2011/12 financial year, there will be availability fees payable by the Councils in respect to the capital that is being expended up to the commissioning date. There will also be landfill levies and transport costs applicable in respect to the mixed waste organics that will need to be landfilled. It has been estimated that this will require an increase of $13.70 per Waste Management Charge. This increase has been accommodated in the Councils 2011/12 fees and charges and delivery and operational programs. A one off 20% capital contribution which will fall due in July 2011 is to be apportioned between the Councils commensurate with number of garbage services as at 30 May 2011, being Coffs Harbour – 28994, Nambucca - 8007 and Bellingen 4168. The upgraded plant will be commissioned on or before 1 July 2012, at which time the Councils will no longer be responsible for disposal of mixed waste organics which will be then used for beneficial purposes. Thus NSW landfill levy obligations and disposal costs will decrease, and processing costs will increase. At that time a further $18.30 increase would be required in the 2012/13 Waste Management Charges. No further extraordinary increases in processing costs are anticipated for the balance of the contract. The 2012/13 Waste Management Charges will also need to accommodate the NSW Government’s Section 88 Waste Levy which will increase from $31.10 per tonne in 2011/12 to around $42 per tonne in 2012/13. Nambucca Shire Council has sufficient funds in its domestic waste management reserve to pay for the one off 20% capital contribution of $142,000. The 2011/12 budget has also made provision for an additional processing contingency of $96,600 which may or may not be required, depending upon the timing of the commissioning of the new plant. Council recently resolved to offer to sell Lot 100 in DP 1041228 being 100 Kylie Street Macksville to the registered proprietors of Lot 162 in DP 614701 for a sale price not less than $60,000 (Exclusive of GST). The registered proprietors of Lot 162 subsequently questioned the valuation used to arrive at the proposed sale price and requested a second valuation be considered. A second valuation has been completed at the expense of the owners of lot 162. The second valuation assessed market value for the land at $50,000 exclusive of GST. It is recommended that Council, in accordance with normal practice, revise the proposed sale price to the average of the two valuations. 1 Council can retain the land or seek to sell the land on the open market. 2 Council can seek a higher sale price. Council is the registered proprietor of lot 100 in DP 1041228 located on Kylie Street in the Macksville Industrial Estate. The land was deliberately retained by Council to ensure access to the industrial zoned land immediately behind lot 100 (being lot 162 DP 614701 hereafter referred to as the “Nash land”). The registered proprietors of the Nash land have submitted a development application to excise the portion of the industrial zoned land with a view to marketing the land for sale and future development. Legal access is proposed via the council owned land. a Satisfactory arrangements have been made for the provision of Public Legal Vehicular Access to proposed Lot 1. Evidence of compliance with the above condition, sufficient to satisfy the Council as to this matter, must be provided within 12 months of this notice. If satisfactory evidence is produced, in accordance with this requirement, Council will give notice to the applicant of the date from which the consent operates. To ensure that Council’s intention that Lot 100 is used as an access to the remaining industrial zoned land it is proposed to condition any sale with a requirement that the land be consolidated into a single lot. Should the land be further developed such that public road access is required the dedication of the land as road can be considered as part of Development application for that project. The sale of the land as recommended will achieve Council’s original intention and serve to facilitate the potential future development of the Macksville Industrial Estate. Two independent assessments of market value have been completed by independent valuers with the average market value of the two being $55,000 exclusive of GST. It is recommended that Council revise its offer to sell the land to the registered proprietors of Lot 162 in DP 614701 to a sale price not less than $55,000 (exclusive of GST). It is further recommended that the offer remain open for a period of not more than three months. The recommendations do not give rise to any economic issues. It should be noted however that in selling the land for access to the balance of the industrial estate council is facilitating the potential further development and growth of the estate. The recommendations do not give rise to any significant risks. Proceeds from the sale will be directed to the land development reserve and will not impact on current and future budgets. Working funds are not required for this transaction. The report includes notes of the more significant announcements made at the LGMA Forum and Shires’ Conference held in Sydney between 30 May and 1 June 2011. The Mayor as well as Councillor Flack, Councillor Smyth and myself attended the Shires Association annual conference in Sydney on 31 May and 1 June. The Mayor and myself also attended the Local Government Manager’s Forum on 30 May. The major opportunity presented by both the LGMA forum and the Shire’s Conference was to hear first hand about the new state government’s plans for the strategic direction of NSW local government. In relation to local government he said that the government was serious about fixing infrastructure. He announced a council by council audit of the backlog in infrastructure. He endorsed collaborate arrangements to improve efficiency whilst maintaining local democracy but also indicated that many people had put a case to him for the amalgamation of councils. He indicated that consideration had to be given for incentives for councils to amalgamate but that a “one size fits all” approach to governance via amalgamations was not supported. He sought more flexible governance models. He spoke about the Code of Conduct and the problems General Manager’s have with being its “gate keeper”. He flagged that a discussion paper would be issued the following Wednesday in relation to this. He indicated that councils have to connect with their communities and provide local leadership. The role of the general manager being to provide strong, clear and impartial advice. They spoke about the process to obtain special rate variations. A council needs to demonstrate a need; community support; a reasonable impact on ratepayers and a sustainable financial strategy consistent with intergenerational equity. They encourage that councils seeking special variations meet with IPART as early as possible. They have observed that councils with thorough asset planning and completed IPR did better than those councils which had not achieved this. In terms of consultation the special variation has to be added to the rate peg amount. IPART want the affect of special variations shown year in/year out. IPART will be refining process for 2012. They will require councils to be clear in consultation material and clearly explain multi year increases are cumulative. They believe the IPR process should be completed well before there is consultation on a special rate variation. Special variation proposals for 2012 need to be developed now. IPART intend to bring forward the date for special variation notification to January 2012. IPART believe there is scope to use a special variation to recover extraordinary increases in RFS contributions. The forum comprised the General Managers’ of North Sydney, Waverly and Wollondilly Councils, all of which had sought a special variation due to be announced on 10 June 2011. Penny Holloway suggested councils would require 6 months of consultation for a special variation. North Sydney Council put out cases for and against a special rate variation. Those councillors who opposed the variation had the opportunity to list their reasons. The Act and Regulations allow a Section 508A variation to extend over 7 years. IPART indicated concern about a 7 year term rather than 4 years which aligns with the election cycle. Mr Harriss spoke about the water utility reforms. There are 106 local water utilities in NSW serving 1.8 million people. The Country Towns Water and Sewerage Program has been around for 100 years and 462 water and sewerage projects have been completed with funding from the program since 1994. Increased price for water has resulted in a 50% decrease in demand since 1999. Whilst Mr Harriss believes there are inaccuracies in the Infrastructure Australia Report which calls for the amalgamation of NSW water utilities he believes that smaller utilities are not performing so well and that alliances will be an increasing focus. Indicated he will reverse the JRPP representation to put 3 local and 2 appointed representatives. Councils will have a choice as to who runs the 2012 council elections, the NSW Electoral Office or Council itself. The Minister advised of a major forum to be held in Dubbo in August concerning the future of local government. It will provide a long term vision for councils for the next 25 years. Options will include looking at flexible models and the use of incentives to break down existing barriers. He indicated the Government is committed to reviewing the Local Government Act in its first term. He indicated support for resource sharing and also reviewing/removing the constraint on establishing corporations under Section 358 of the Act. The Government will be undertaking a Council by Council audit of infrastructure backlog. NSW has been provided with $3.2m from the Local Government Reform fund with targeted assistance to be provided to 40 Councils in IPR Group 3. The Minister flagged the Government’s wish to unlock $1billion to fund infrastructure across NSW and referred to a proposed program which would provide Councils with a 50% subsidy on borrowing costs for infrastructure. The Government has flagged a decade of decentralisation . Cr Smyth asked about the NSW Government’s contribution to public libraries. The Minister indicated that he was aware that NSW libraries were relatively poorly funded compared to other states and identified an additional $2m in funding which would be forthcoming. Portfolio includes all regional water utilities but not the Sydney or Newcastle Water Corporations. Doesn’t believe in a one size fits all approach for water utilities. Is looking closely at the Country Towns Water and Sewerage Program. $1 billion being unlocked to build infrastructure. Referred to the franchising of Sydney Ferries. Referred to only 50% of the Pacific Highway being constructed to dual carriageway standard, about 337 km. He wants the highway finished by 2016. Referred to the Timber Bridge Partnership with local government on regional roads. In 5th and final year and has asked the RTA to address options for the remaining bridges not reconstructed under the partnership. The NBN roll out will occur over 9 years with 10 million premises to be connected. At its peak the NBN will have a peak construction workforce of more than 15,000 people connecting 5,900 premises a day. The total spend for the NBN is $43 billion. There are no financial implications. The cost of attendance was met from existing budgets. Council has received advice from the Catholic Diocesan Office at Lismore that the Bishop has instructed their solicitor to proceed with an appeal against the decision of the Joint Regional Planning Panel (JRPP) to refuse the application. They also propose to submit an application to the Land and Environment Court to expedite a hearing of the appeal. Council’s involvement in the proceedings should be restricted to simply submitting the report which Council considered and advising the Court of the subsequent resolution to support the development application. The attendance of its solicitor at the hearing should similarly be restricted to only those times necessary for this to occur. This instruction has been provided to Council’s solicitor, Norton Rose. 1. That the information concerning Council lodging a submitting appearance to an appeal by the Catholic Diocesan Office against the refusal of the Joint Regional Planning Panel to issue consent to the proposed Catholic Primary School in Dudley Street, Macksville, be received. 2. That the Department of Planning be advised that Council will not be providing funding or legal support to the Joint Regional Planning Panel for any appeal in relation to their refusal to issue consent to the proposed Catholic Primary School in Dudley Street, Macksville. However Council will meet the costs of its Manager Planning and Assessment attending the court as required. 3. That Council’s local member, the Hon. Andrew Stoner MP be advised of Council’s action. Council has the option of not submitting an appearance. However this option would seem bizarre given that Council will be the respondent in the appeal and further that it concerns a development application which by value is one of the largest submitted to Nambucca Shire Council. The Diocesan Office has sought Council’s assistance in lodging a submitting appearance to the appeal and has asked that Council instruct its solicitor accordingly. Legally, JRPP’s “determine” certain development applications, and are “taken to be the Council” and are to exercise certain functions “to the exclusion of the council”, but they are of course not the Council. The council remains the consent authority, and therefore the council is the party who is appealed against where the applicant wishes to challenge the JRPP’s decision. Amendments to the Environmental Planning and Assessment Act which commenced in February this year (Section 97A(2) require the Council to notify the JRPP of any appeal, and provide that the JRPP is “entitled to be heard at the hearing as if it were a party to the appeal”. The Council continues to automatically be a party to the appeal. Of course given the circumstances Council will be in the bizarre situation of being nominated as the respondent in an appeal against a development application which, by majority, it supported. Equally Council should advise the Department of Planning that in the circumstances of the JRPP exercising Council’s authority to refuse the development application when the majority of the Council believed it should be approved, that Council will be providing no funding or legal support to the JRPP in defending the appeal. The JRPP will likely request or subpoena Council’s Manager Planning and Assessment to provide evidence, the cost of which should be borne by Council. Council has also received a response from the Hon. Andrew Stoner to its representations about a review of the decision. The response is attached. There has been consultation with Council’s solicitor, Norton Rose. The major risk to Council in the legal action is in relation to incurring unanticipated costs. At this stage it is anticipated that there will be a relatively small (less than $10,000) impact on Council’s budget for legal costs. Should advice from Norton Rose or the JRPP change this, then the matter will again be reported to Council. The minutes of the Nambucca shire Traffic Committee meeting held on 7 June 2011 are attached for Council’s information and adoption. 1 The Nambucca Shire Traffic Committee meets every two months, generally on the first Tuesday of that month. 2 The members of the Committee met on 7 June 2011 and determined a number of matters as per attached minutes. That the Committee note the adoption of the Minutes of the Meeting held on the 5 April 2011 were adopted by Council on the 21 April 2011. Mr Duffus advised the committee that he did not receive a response from the Roads and Traffic Authority concerning item 6B 33/10 in relation to the request for the reduction of the speed limit at the northern end of Pacific Highway Nambucca Heads. Roads and Traffic Authority advised a working party will be conducting a safety review of the Pacific Highway between Kempsey and Urunga on 4 July 2011 and that Mr Duffus will be invited to address the Committee. Roads and Traffic Authority confirmed the issue of Road Safety and speed zones on the Pacific Highway is not an issue for Council or the Local Traffic Committee to be concerned with and that all correspondence be directed to the Roads and Traffic Authority. That Council install appropriate regulatory signage at the dedicated bus bay/turning circle on Valla Beach Road, Valla Beach, restricting access to buses only and restricting parking either side of the access. That Council approve the installation of signs outside the Bowraville butcher shop at 50 High Street, Bowraville restricting parking to 15 minutes 8.30 am – 4.30 pm Monday – Friday and 8.30 am– 12.30 pm Saturday, for a distance of 14 metres (2 x parallel parking bays). · Wallace Street (Southern side) at the eastern approach to the pedestrian crossing (2 spaces), also install No Stopping sign at the intersection with Matilda Street. · Wallace Street (Northern side) east of the pedestrian crossing in lieu of the existing shorter bus zone (5 spaces). · Council also upgrade existing School Zone signs to reflect bus zone timing 8:00 am – 9:30 am and 2:30pm – 4:00 pm school days. 1. That subject to available funding Council install concrete channelisation measures within Banksia Crescent at the junctions with Blue Gum Street and John Avenue Nambucca Heads with the intent of slowing speeding vehicles within a residential area. 2. If insufficient funds are available Council request funding from the Roads and Traffic Authority under the “Traffic Minor Intersection Improvements” scheme. That Council remove the taxi rank from its existing location and, in consultation with the Bowraville Chamber of Commerce, reinstate the taxi rank to a suitable location, when required. The next meeting will be held on 2 August 2011 commencing at 10.30 am. There being no further business the Chairperson then closed the meeting the time being 12.00 pm.